Caroline Rose stands alone behind Falstaff’s stage, where she’s set to perform her new album Loner, and tunes her guitar. Night has fallen on Sept. 13, and the muffled sound of the opening act forces Rose to lean her head close to properly hear her notes. I approach her for a photograph, not entirely certain that the person I am walking towards is even Rose herself. Luckily, it is. She seems hesitant to have her photo taken. She doesn’t have her signature red uniform on, and I catch her off guard, unprepared. The photo has to wait until Caroline Rose is performing as Caroline Rose. Later, Rose wanders through the crowd and onto the stage, now adorning her red overalls and red shirt. The stage is decorated with a red chicken, a grungy looking garbage Elmo (also red, even if a little dirty) and red artificial roses that wrap around the microphones. Seriousness is not the atmosphere Rose is going for—she plays a recorder interlude, chugs a beer and crushes the can against her head—yet her music does not lack purpose. Her lyrics contain wit, insight and criticism that is easily digestible, while her goofy on-stage antics make her easy to enjoy — a breakdown of possible barriers between audience and band. She is very much human, and her on-stage presence breaks down any possible barriers between audience and band. At Falstaff’s, Rose channels her new album, which is laced with punchy synths and studded with smart lyrics, in a high energy and fun show. We were having half as much fun listening to Rose’s music as she and her band were having playing it. This kind of high energy is the mark of a truly captivating musical act, one that Lively Lucy’s, the club who hosted the concert, can only hope to bring back again and again to Skidmore. 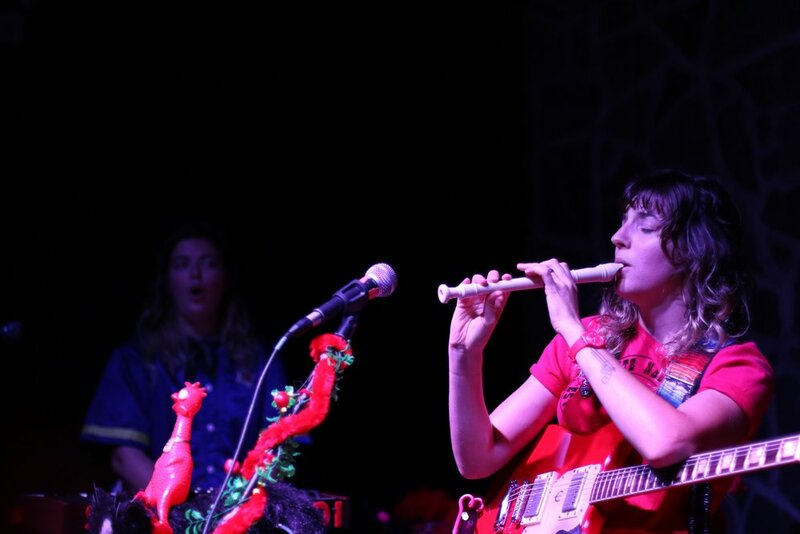 Here’s hoping for more Rose-esque concerts from Lively Lucy’s and SEC throughout the year, and a spot on the Falstaff’s stage welcoming her beer-chugging, recorder-playing return to the stage any time.